Laura is a Registered Veterinary Nurse who came to work with Eastbourne Vets in Mach 2017. Laura graduated in 2016 having completed her studies in Athlone, Ireland. 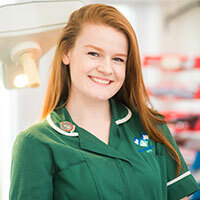 She is currently completing our New Graduate Academy with the view to improve her nursing skills in all areas and particularly enjoys in-patient care.